Located across the road from Park Beach, The Tahitian Holiday Apartments offers spacious apartments with free Wi-Fi and a private balcony overlooking the pool and jacuzzi. All of the self-contained 1 and-2 bedroom apartments at The Tahitian Coffs Harbour are air conditioned and include full kitchen facilities, plus a lounge area with DVD player and cable TV. 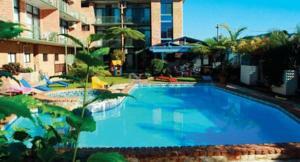 Facilities include an outdoor swimming pool, jacuzzi and sauna. The tropical grounds feature a barbecue area. Guests also have access to laundry facilities and free undercover parking. The Tahitian Holiday Apartments are just a 5-minute drive from Park Beach Shopping Plaza. Park Beach Bowling Club is only 650 ft away. Free! All children under 5 years stay free of charge when using existing beds. Up to two children under 2 years are charged AUD 10 per person per night for baby beds. One older child or adult is charged AUD 15 per person per night in an extra bed. The maximum number of extra beds in a room is 1. The maximum number of baby beds in a room is 2. Any type of extra bed or crib is upon request and needs to be confirmed by management. Supplements are not calculated automatically in the total costs and will have to be paid for separately when checking out.